A masculine take on townhome living at Admiral's Gate in Collingwood. A version of this article originally appeared in the Fall/Holiday 2018 issue of OUR HOMES Southern Georgian Bay, p.68. Find local businesses in our Southern Georgian Bay directory. Louis Cote has spent decades dressing clients from around the world in fur. A trusted stylist, Louis makes sure his clients stay warm, cosy and looking fabulous all winter long. Fashion and interior design go hand in hand. While working at Holt Renfrew and Hudson’s Bay Company, Louis also studied interior design at The International Academy of Design. He has curated homes in Toronto, across Ontario and as far away as California. 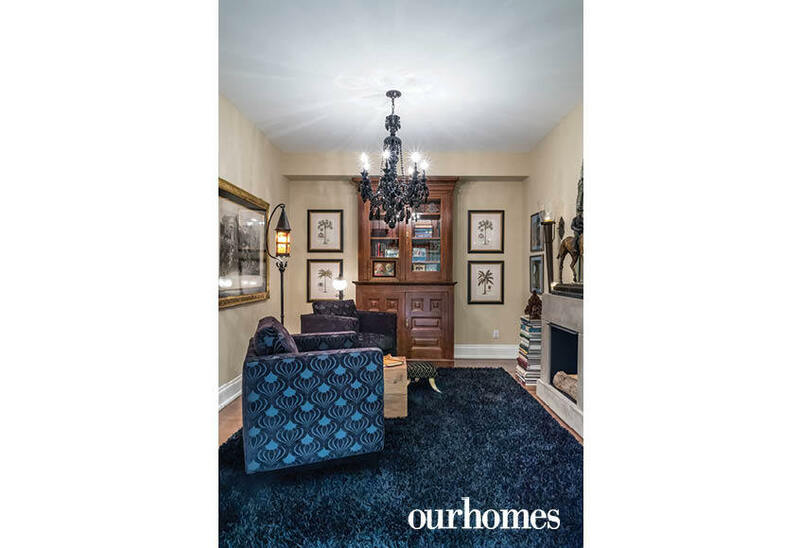 Louis’s partner Jack Cantwell, an oil and gas executive, sold a Grand Victorian home in Petrolia, west of London, Ontario, and purchased a four-season weekend home at Admiral’s Gate in Collingwood, giving Louis free reign on the interior design. 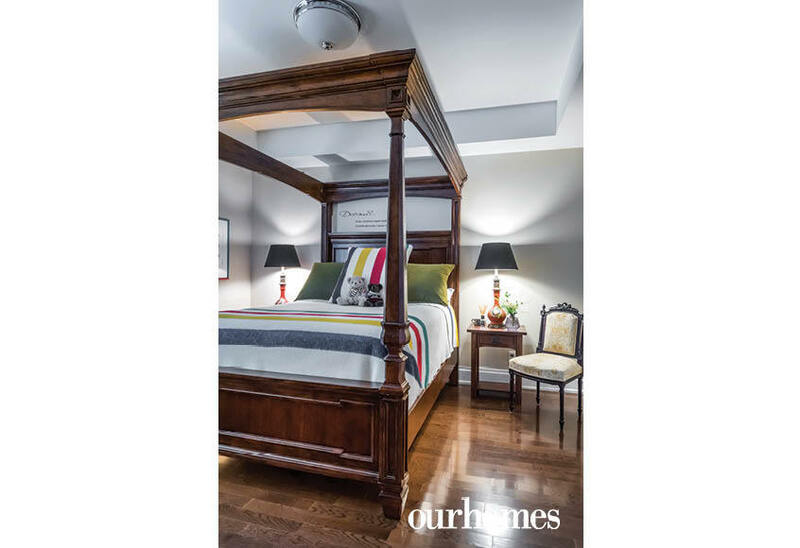 "The original design choices and finishes worked, especially the classic millwork and original mouldings," says Louis. 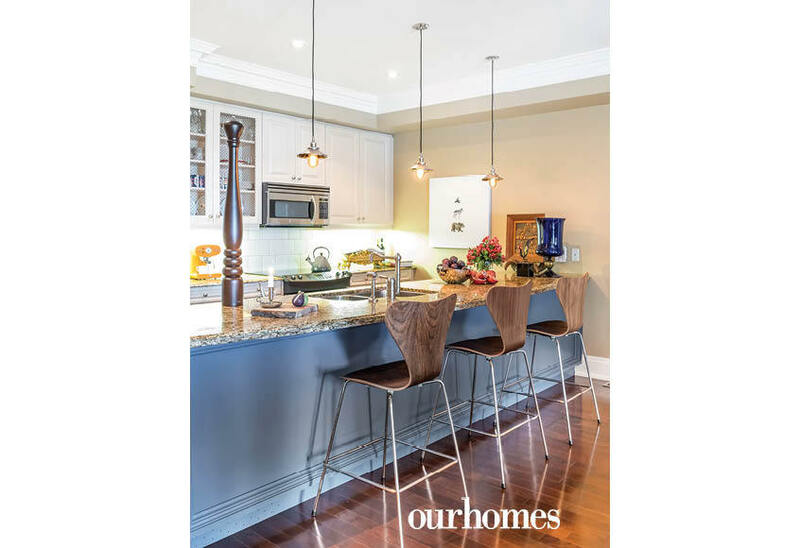 "I added contrast with paint, especially in the kitchen where we had the cabinets and island refinished by Cabneato in Benjamin Moore’s heritage colours. I also updated the fireplace and added new lighting." The home shows off art by local artists, including Sheila Fox and Heather Cook (Butter Gallery). 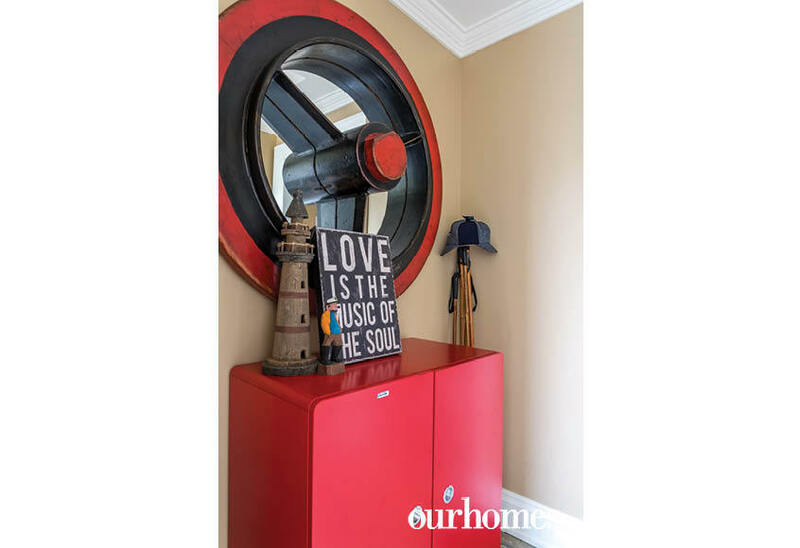 A tool and die mould sits atop a red garage cabinet in the front foyer. 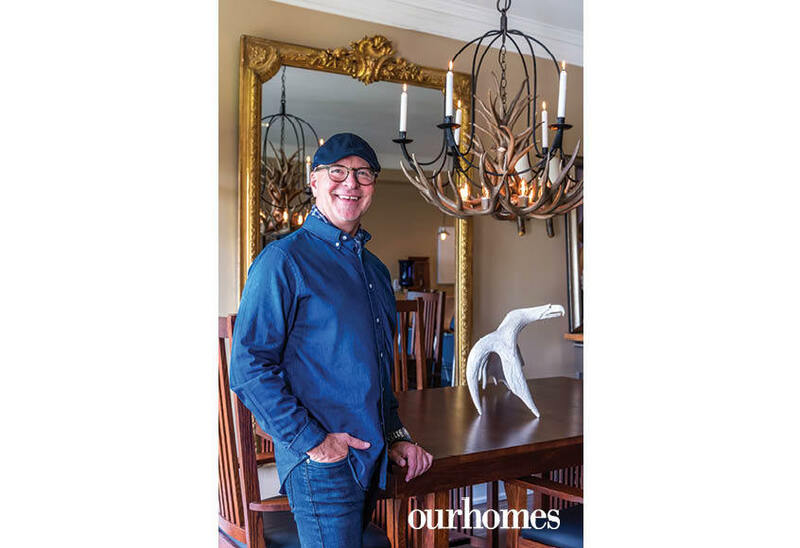 Designer Louis Cote stands in the dining room. Louis layered an iron candelabra over an antler chandelier. The large French mirror enhances the space. Details in the living room demand attention and are a testament to Louis’s ability to successfully mix various periods of furniture, including the black hand-carved shield-back chair with a jester-patterned foot stool, next to a Charles Eames-inspired chair. Two wood columns flank the fireplace, refinished in heritage blue, to match the kitchen island. 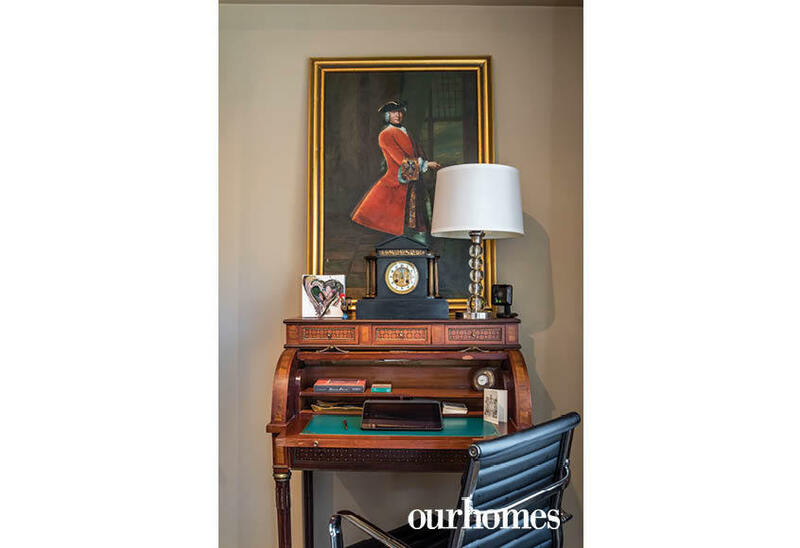 An exquisite, antique roll-top desk, an onyx mantel clock and a period portrait take over a corner in the living room. The simple kitchen makeover included enlisting Cabneato to paint the cabinets and island, new stools and lots of fine, but practical, accessories. An ecclesiastical stand in the back corner now works perfectly for keeping cookbooks open to the right page. The bear, wolf and eagle painting is by Heather Cook found at Butter Gallery. Louis topped a surgical cabinet with a live-edge wooden top. 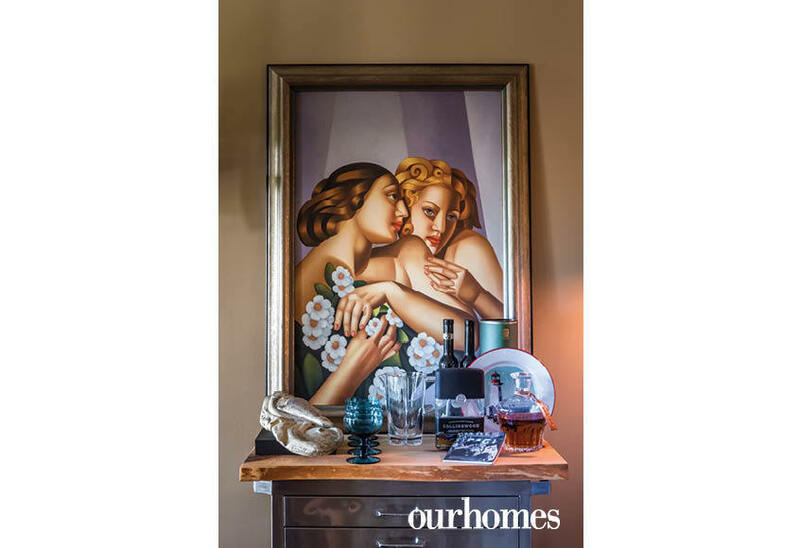 A favourite piece of Art Deco art by Tamara de Lempicka hangs above. A black Schonbek crystal chandelier and an ethanol concrete block fireplace set the mood in the library. On the wall is an old Italian engraving from the 1800s called La Via Appia. The bedroom is decorated in iconic Hudson’s Bay Company bedding. The classical lamps were converted from gas. Jack’s twin sister died at an early age. In her memory, her silver cup sits on the bedside table. 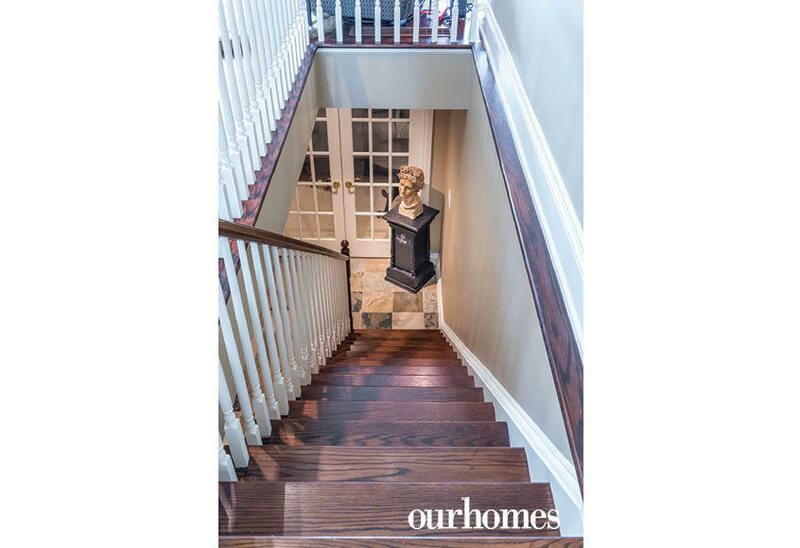 An oversize neo-classical bust sits on a wooden column at the bottom of the stairs to the lower level.